With the iconic Arthur’s Seat as a backdrop to the conference, they spoke to over 100 delegates on day 1, which gave Neil and Mark the opportunity to share some of the research coming out of the Environmental Extremes Lab around altitude screening and how this can be combined with education to help people be more altitude aware. It was surprising to Neil and Mark how little many of the delegates knew about altitude and the illnesses individuals could experience. What’s more, knowledge about what you can do to make your expedition more enjoyable, improve the chances of success and importantly, safer, was limited amongst many. 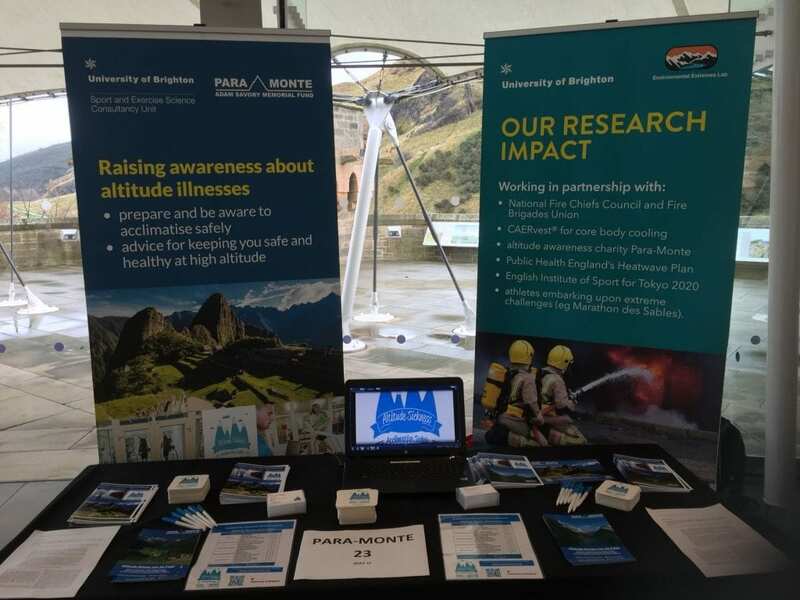 Taken together, this reinforces how important the charity work of Para-Monte is, to spread the word about preparing and being altitude aware and expanding its reach internationally. This entry was posted in Altitude, Expeditions, Para-Monte, Research by Neil Maxwell. Bookmark the permalink.